British Recycled Plastic supplies recycled plastic bollards manufactured from 100% recycled mixed British plastic that would normally finish its life in landfill. These products are elegant, vehicle-friendly, classical in design and very cost effective. They also demonstrate that you can use environmentally sustainable solutions without compromising your choice. 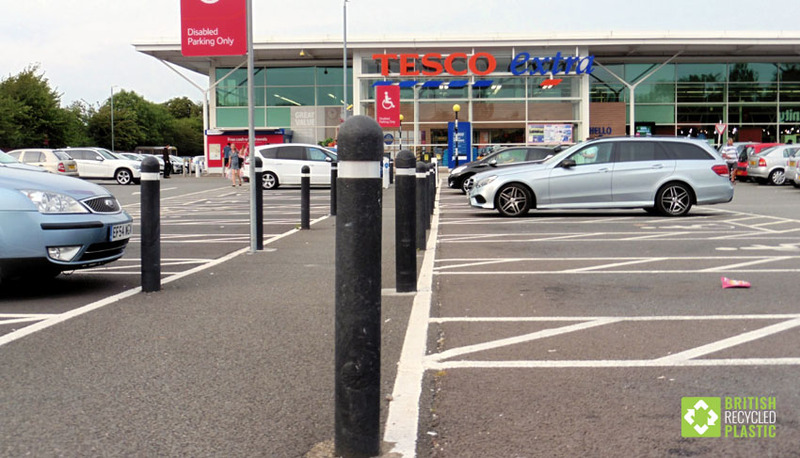 Most of the British Recycled Plastic bollards manufactured that you will see in supermarket car parks, like the Tesco example above, are made of 100% recycled plastic and nothing else. 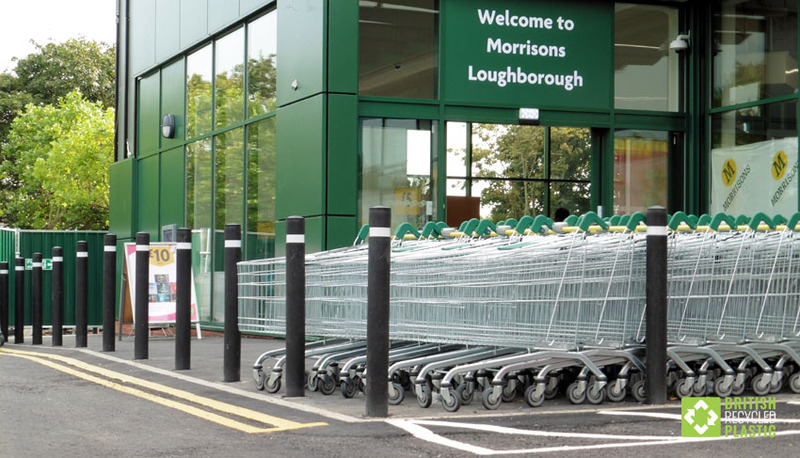 Some, however, like these ones at Morrisons are hiding an incredibly strong 35mm diameter impact resistant steel core, designed to prevent vehicle access. We are able to turn round most bollard orders in a short time to keep our customers from waiting too long. 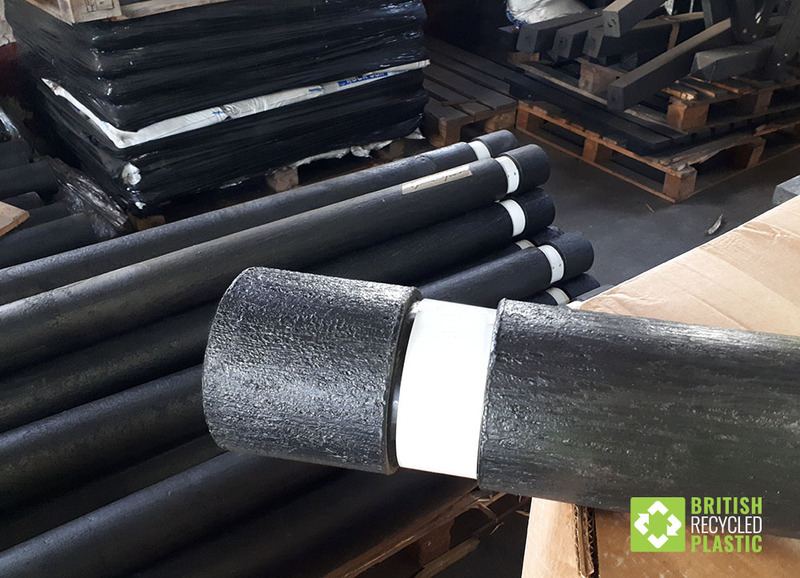 Mostly, they are made to order, but we also hold some stocks of our most popular 120mm diameter Halifax bollards, complete with 50mm white reflective bands, with either flat, domed or chamfered tops. We also offer any colour combination of white, yellow and red reflective bands in either 25mm, 50mm or 80mm size. Whichever size our customers want, the bands are set in a routed recess on the bollard to fit. Most people are familiar with our black cylindrical bollards. 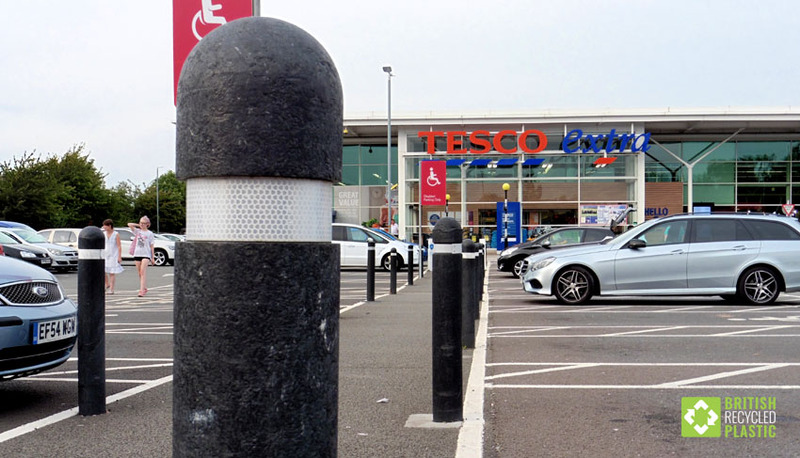 Right across the UK, our 120mm and 150mm diameter bollards can be seen in hundreds of car parks. We also supply square bollards too. These are more of a common sight in continental Europe but a growing number of our British customers are also choosing them, like this supermarket in the East Midlands. 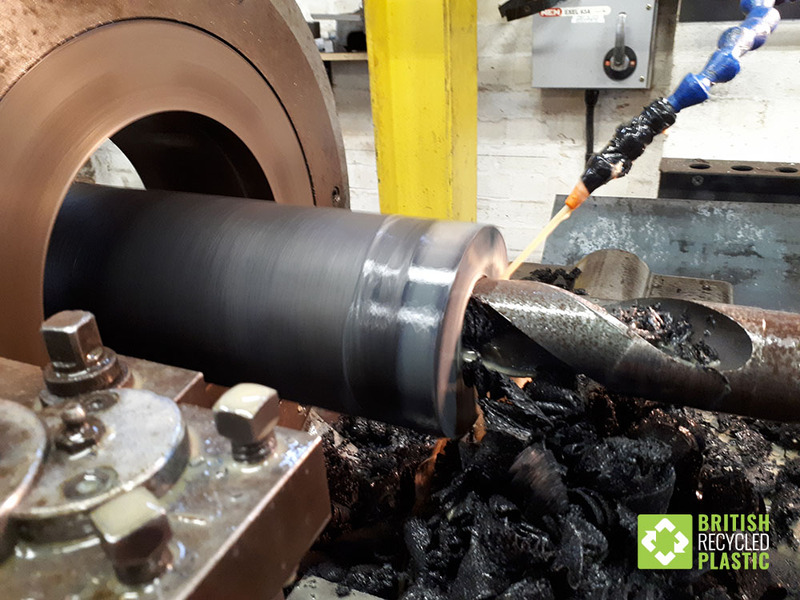 Before a steel bar can be added as reinforcement to one of our recycled plastic bollards, the core needs carefully drilling out. Water is constantly jetted on to the drill tip to keep it cool and to make sure the cavity is extremely accurately hollowed out so the steel core fits perfectly snugly. It has a very important job to do, after all. Once added, the bar also protrudes a further 200mm from the base of the bollard, making it incredibly impact resistant. 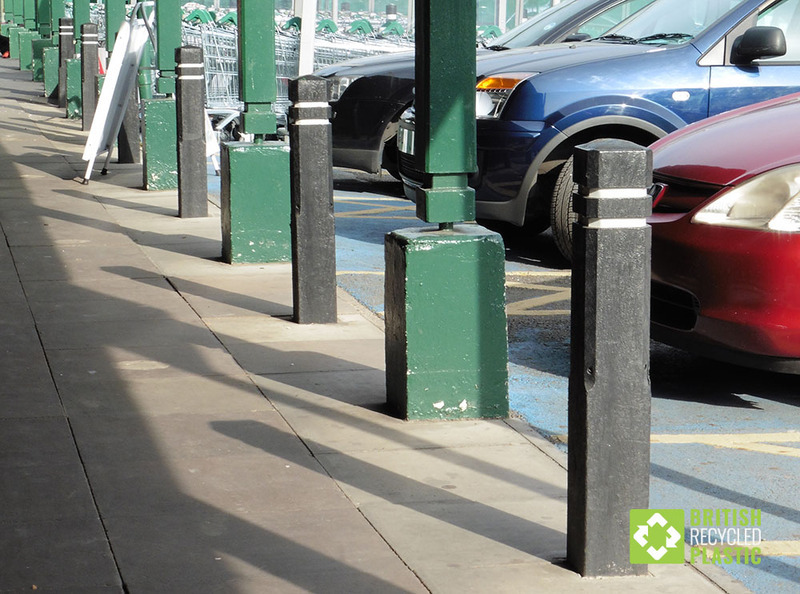 Recycled plastic bollards are stronger with higher impact performance when compared to other solutions. These products provide a durable, economic and environmentally friendly option.